Following strong consumer feedback, it gives us great pleasure to launch After-Care for Shower Glass Refill packs! 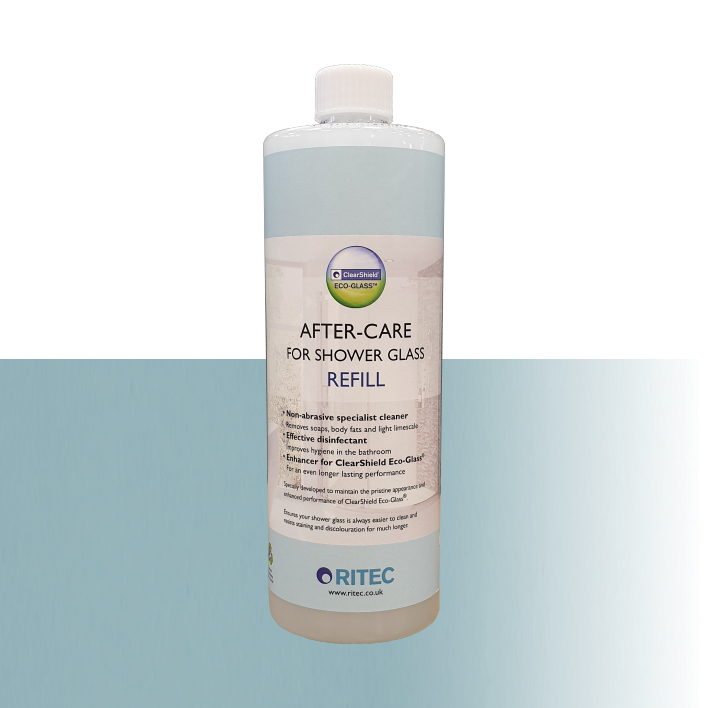 This new product pack size addresses consumers’ wishes to keep the original trigger spray bottle to re-use rather than disposing or recycling it. Available in 500ml cylindrical bottles, this pack size uses significantly less plastic (57% less by weight!) compared to the standard trigger spray bottle – great news in today’s climate where consumer attitudes are shifting towards less plastic usage. It also costs a few pounds less than the standard trigger spray version so keeping your ClearShield® shower sparkling like new has never been more cost effective! Exclusive from Ritec, visit our secure online shop www.clearshield.biz to purchase (UK and Republic of Ireland only). Ritec International, pioneers of the ClearShield Eco-System™ for the renovation, ‘non-stick’ protection and maintenance of glass, is now able to claim products in the System are ‘green’ after successfully attaining Singapore Green Building Product (SGBP) approval. Awarded by the Singapore Green Building Council (SGBC), its SGBP scheme is regarded as one of the key standards and benchmarks for green building products in the building and construction industry. As such, the SGBP is well recognised under the Green Mark Scheme, Singapore’s national green building rating tool administered by the Building and Construction Authority (BCA). The Singapore Green Building Product Certification Scheme was launched by the Singapore Green Building Council (SGBC) in September 2010 to support the BCA Green Mark Scheme, and help the building industry move towards sustainability. The certification provides consumers, building industry stakeholders, and government procurement system a listing of assessed and certified green building products in the following categories: Mechanical, Electrical, Facade and Roof System, Concrete and Structural, Interior System, Finishes, Recycled Material, and Renewable Energy. To be awarded SGBP’s green building product status, Ritec’s ClearShield® formulations exported to the region were assessed on their environmental properties and performance through a comprehensive list of criteria covering the five key areas of Energy Efficiency, Water Efficiency, Resource Efficiency, Health & Environmental Protection and Other Green Features. The assessed Ritec ClearShield® products were ultimately awarded with a two tick ‘Very Good’ rating. Obtaining the SGBP label of approval means these products are assured of their superior environmental performance benchmarked against current industrial standards. Since 2010, Ritec Services have protected an astounding 120,000m² of glass with ClearShield® on Norwegian Cruise Line ships, the equivalent of almost 30 football pitches! This includes all newly-built ships of the prestigious cruise line, seven in total. Highly-experienced applicators carry out a deep clean during the final phase of construction to remove all glue, paint, silicone sealants and mineral salts deposits, restoring the ‘as-new’ appearance of the glass. The glass is then protected by award-winning ClearShield® ‘non-stick’ glass technology to help ensure it remains that way for as long as possible. At sea, crew members spend less time cleaning glass (thanks to ClearShield’s easy-clean properties) and use less water doing so, and passengers can admire the amazing views. For more information, please click here: www.ritec.co.uk/marine-vessels or contact us at info@ritec.co.uk.